My inadvertent tour of Paris train stations continues this morning with a trip to Gare de l‘Est. 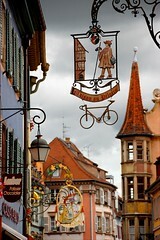 I’m heading off to Colmar, a small town in the Alsace region of France, near Strasbourg and the German border. It’s a long way away and a TGV high speed train is the only thing that makes covering such a distance possible as a day trip, but it also requires booking well in advance. Now that I’m here, I’m a bit skeptical of my original plans given the menacing sky overhead. 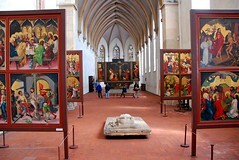 Colmar is a small city with some first rate art, including the Isenheim altarpiece at the Musée d’Unterlinden, and a sublime painting of the Virgin Mary in a rose bower by Martin Schongauer at the Dominican church. 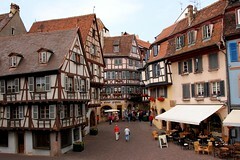 However, the prime attraction is really Colmar itself, billed as something of a storybook village with streets of colorful, half-timbered houses, the kind of place where Hansel and Gretel might feel at home. I think about all of this on the journey east and wonder what will happen if it rains. I suppose it will like a page out of Grimm’s fairy tales, which always were—let’s face it—pretty grim. It’s just after 11 AM when the train pulls into Colmar station. From here, it’s about a 15 minute walk down Avenue de la République to the historic center of town, past a lovely park called the Place du Champs de Mars. I veer off to the right by an old-fashioned carousel to take a closer look at a statue at the center of an impressive fountain and find that it honors A.J. Bruat (which, quite frankly, means nothing to me), but it was crafted by Frédéric Auguste Bartholdi, the famous French sculptor who was born in Colmar and who is best known for having designed the Statue of Liberty in New York harbor. I walk a bit further, past where Avenue de la République becomes Rue Kleber and come to a small shaded square in front of the Musée d’Unterlinden. I’m looking forward to my visit there, but I’d rather stay outdoors for as long as I can before the rain comes, as surely it will. I have a tourist map of the city with the route between major attractions highlighted in pink, so I follow it a short distance and stop in front of La Maison des Têtes. 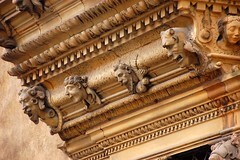 Built in 1609 for a local merchant, the fanciful façade is ornamented with more than a hundred disembodied heads. Some have menacing expressions, but most are humorous, including an ogre that looks remarkably like Shrek, and a court jester with the kind of floppy hat and jingle bells one might see at a Renaissance Fair. The path dictated by the map takes me further along Rue des Boulangers, to the Dominican Church, where I stop to admire Schongauer’s Mary, painted in 1473. Holding the baby Jesus to her shoulder, she is surrounded by a trellis of red roses in which a variety of songbirds sit among the thorns—a robin, a sparrow, a warbler, a goldfinch. Two angels dressed in blue hover overhead with a crown of gold. The pamphlet I purchased in the gift shop says that it combines stylistically the best of Germanic and Flemish art into a work of “great force, strange charm, and intense emotion.” I’ve seen a quite a few medieval altarpieces through the years, nearly to the point of boredom when the same iconography is repeated time and time again, and yet here I stand utterly transfixed. The route on my map continues, past the Collegiate church of Saint-Martin and the spectacular Maison Pfister, to the tanner’s district near Place de l’Ancienne Douane, and finally to a colorful cluster of houses on the river Lauch known as “La Petite Venise.” Colmar is indeed a charming place of gingerbread houses and wrought iron trade signs, like something lifted out the pages of a fairy tale, but the walk has brought into sharp relief a problem that I had not fully appreciated in all my months of planning. It’s a Sunday and nearly every shop is closed, including many restaurants. 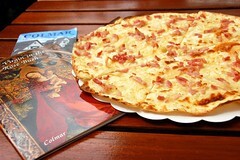 I take a quick survey of my depleted options and decide to break for lunch at La Krutenau, where like everyone around me, I order the tarte flambée—an Alsatian dish made from a thin circle of bread dough covered by crème fraîche, bacon, and onions. It’s warm and tasty, the perfect antidote for a chilly day. Afterwards, I retrace my steps in the spitting rain and spend the next two hours wandering the halls of the Musée d’Unterlinden, which is housed in a 13th century Dominican convent. Aside from the beauty of the architecture itself, which includes a lovely Gothic cloister, the museum has an impressive collection of medieval paintings and sculptures that represent the best of the Upper Rhine. Their most famous work—the towering Isenheim Altarpiece by Matthias Grünewald—takes pride of place at one end of the convent’s chapel. It was painted in the early 16th century for the nearby monastery and hospital of St. Anthony, where monks treated the victims of skin disorders. To demonstrate God’s sympathy, Grünewald depicts Christ himself (in the lower panel) as suffering from the effects of ergotism, known in the Middle Ages as “St. Anthony’s Fire,” a painful disease caused by the growth of fungus on wet grain. Still, the overall effect provides more fright than comfort. The crucifixion scene is positively brutal, showing thorns that protrude from the flesh on Christ’s torso. In agony, his fingers stretch and arch in vain towards Heaven. 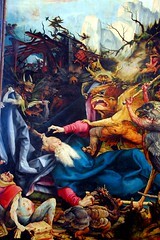 As if those searing images were not enough to keep believers on the straight and narrow, a side panel titled “The Temptation of St. Anthony” shows a hoard of imaginary beasts—similar in whimsy to, but more far malicious than, those in Where the Wild Things Are—dragging the old saint by his white hair into the farthest reaches of Hell. It’s all a bit too much, really: “Too much Good Friday, not enough Easter Sunday,” as a priest and friend of Martin Scorsese once said of the director’s early films. I’m relieved to end my visit on a more cheerful note, by walking through a gallery devoted to folk art. There are cradles and painted blanket chests, harmless paper dolls of Napoleonic soldiers, wood-carved characters in the setting of a jovial Alsatian inn, and a set of romantic 19th century oil paintings of Colmar that show the city streets looking much the same as today. On my way out, I return to the front desk to retrieve the coat and umbrella I checked upon entering. When a woman hands them back to me, a security guard overhears me say “Merci, Madame” and he says “good French”! Surprised, I rock my hand back in forth in a 50/50 sign, giving myself more generous credit than I deserve. Then, moments later, when I buy a guidebook of the museum’s collections, the clerk behind the desk asks to make sure I want the English version. Given the sorry state of my high school French, this amuses me. 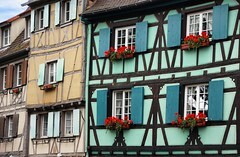 Through my slim knowledge of European history, I know that the Alsace has been traded back and forth between France and Germany through the centuries, so perhaps the modern residents of Colmar have inherited a kind of linguistic confusion. They must have, if they think I speak French well! Soon after I step back out onto the street, the skies let loose with the fury of Almighty God. Between the ferocious wind and the pounding rain, it really does feel biblical in an Old Testament, punishing kind of way. It’s the kind of weather Grünewald might have appreciated. The little train in the square in front of the museum has been abandoned by its conductor and a tall metal sign advertising the route nearly falls on top of me as I go skidding by in search of some dry haven. Alas, the tourist information office closed at 1 o’clock, so all I can do is flatten myself into a narrow doorway and hope for the best. I have a small travel umbrella with me, but its puny plastic skeleton would never survive a storm such as this. As I wait for the worst of the rain to pass, I pull out my camera and use the screen on back to flip through the pictures I’ve taken so far. It’s been a gray and dreary day, and while I’ve fiddled with the white balance to compensate for the clouds, the results are not exactly what I’d hoped for. I begin to think about how I might creatively “enhance” them using Photoshop, wondering how hard it would be to fake a blue sky here and there—nothing too dramatic or dishonest, just a little artistic embellishment. When the weather breaks at last, leaving puddles behind in the cobblestone streets, I look for a quick snack and settle on another regional specialty—a small kougelhopf, which is a raised cake made with almonds and raisins. I notice a poster taped to the store window advertising a free concert at the Dominican church at 5:00 PM. Given the sodden weather and some time left before the TGV train back to Paris, it seems like an inviting idea. The performers are from a boy’s choir called “Les Petits Chanteurs de Saint-André de Colmar,” or the little singers of St. Andrew’s. Their voices range along the musical scale in proportion to their age—soprano, alto, tenor, bass—and blend well together in a program devoted to sacred hymns. Seeing them here in front of Schongauer’s altarpiece—his perfectly incandescent Virgin Mary surrounded by roses—has been an unexpected delight on a day that has been, until now, underwhelming. A further surprise awaits me when I’m forced to slip out early to catch my train—a nearly cloudless blue sky for as far as the eye can see. Hallelujah, hallelujah! Nervously, I check my watch and decide to make one last, mad dash through town, trying to improve upon the pictures I took earlier. By the time I make it all the way back to the station to catch the 6:42 train back to Paris, I’m exhausted and it’s pouring rain again. By the time we reach Strasbourg a half hour later, the sun is shining. It’s been a very strange day. It’s nearly dark when my train pulls into Gare de l’Est. On the metro back to Place Monge, there’s a street singer making rounds through the cars, inexplicably singing Sinatra’s “My Way” in English. I toss him a Euro and think of all my years of solo travel, which have been filled with great joy, but also moments of genuine frustration.